Pof.155, 50h red, pair with plate variety 39 "little-egg in waist" + PLATE PROOF 50h in black color on paper without gum with flaw negative pos. 68 + Pof.154TBa 40h brown - close opposite facing pair + Pof.151, 20h red, blk-of-16 with lower margin, plate 2, plate variety 87, 88, 89, 90, 94 and 98 pos. 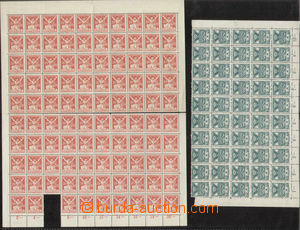 Pof.157B, 60h blue, line perforation, block of four with L margin, lightly hinged in upper pair stamp. 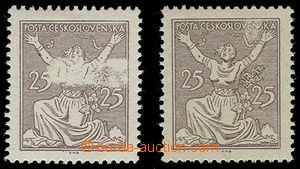 Pof.158A production flaw, 100h brown, block of four with počítady, significant shifted perforation to picture all stamp. 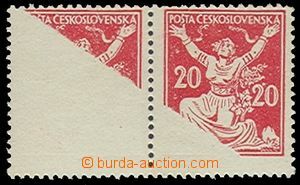 Pof.158VV, 100h brown, pair with několikanásobným stroke perforovacího comb crossways through/over picture stamp. selection of 40 pcs of blocks, stripe and corners, part with plate number, frames, mainly value 50h green, Pof.155, 14 pcs of corner pieces plate number, then value 100h, 8 pcs of with plate number incl. postage-due provisional etc..
1921-24 comp. 10 pcs of various letters, 9x as Registered, 1x Ex, 1x addressed to to Germany, multiple also mixed franking, mainly commercial correspondence; good condition, interesting selection of!